Advent is all about sitting in darkness. One of my favorite advent pastimes is turning all the lights in the house off and stare at the tree. This is not just a “festive” thing to do, but it also has great theological significance. We like to think of the Christmas Season as “the most wonderful time of the year” but it is not Christmas yet, it is Advent, a time when we sit in our darkness and wait. All day I struggled with the word for the photo of the day, “bound”. I was thinking of all the positive things I am bonded to, my husband, children, call, God, but none more than experiencing God in darkness and light, in my personal life, in my faith, and in the world. This tree, which my family lights and decorates tonight is a beautiful symbol of people as carriers of God’s light, bound together by the string of God. 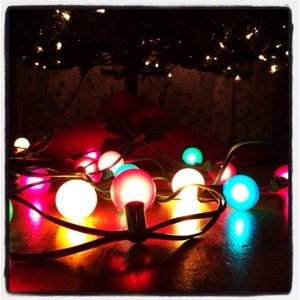 This entry was posted in Ministry and tagged #rethinkchurch advent darkness light. Bookmark the permalink.